Being a new blogger and all, I’m still adjusting to all the great activities I’m able to partake in with my new community. On the 15th of each month, garden bloggers from across the country post the lovely blooms that grace their garden that month. This was started by Carol at May Dreams Gardens. Her blog is super entertaining and I would highly recommend it. Being the plant geek that I am, here is what has got me all hot and bothered during the month of August in my garden. 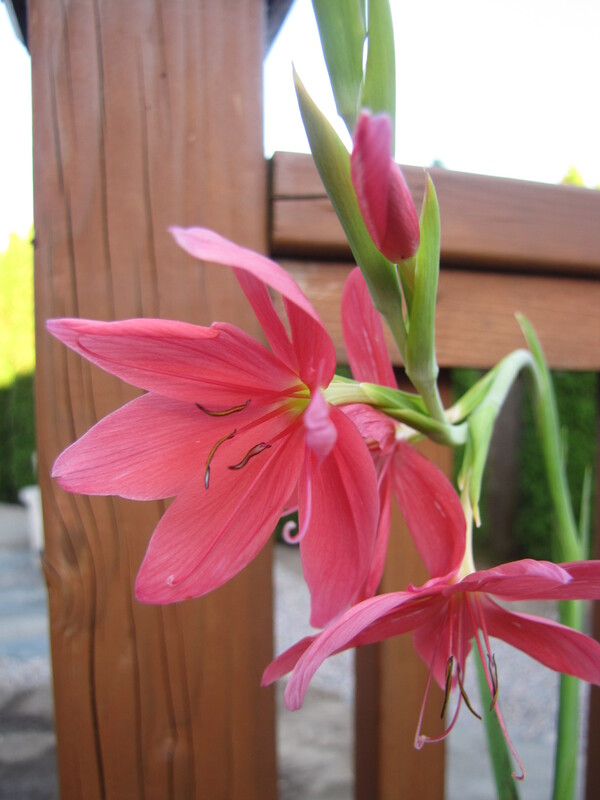 Kaffir Lily (Schizostylis coccinea) is a relative to the Iris family and hardy to Zone 7. The beautiful blooms add late season color to the Pacific Northwest garden as the flowers will hold on til winter. They are an evergreen in this part of the country and a flower that I have fallen in love with. Even though I am in Zone 7a, I will be bringing it in the garage this winter to ensure that I do not lose it. I’m a sucker when it comes to Begonias. 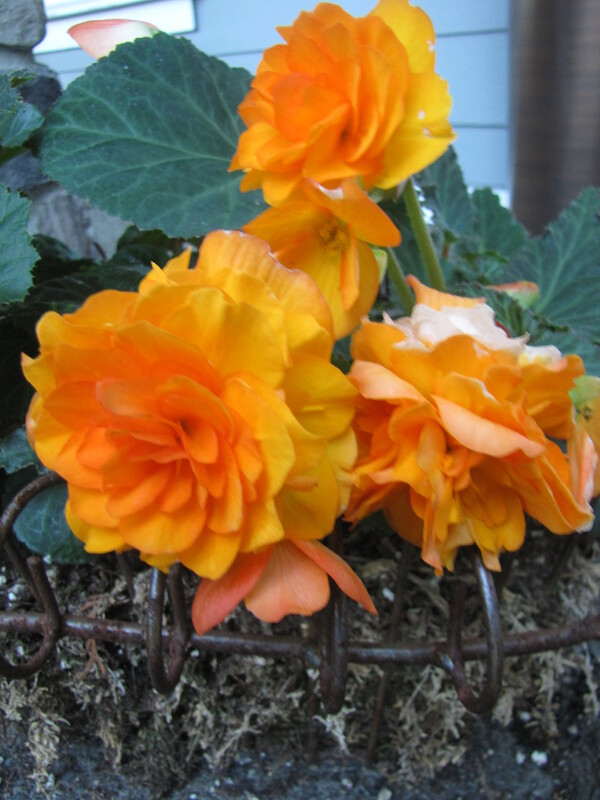 These tuberous Begonias were potted up later than I would have liked and they are finally blooming gorgeously. 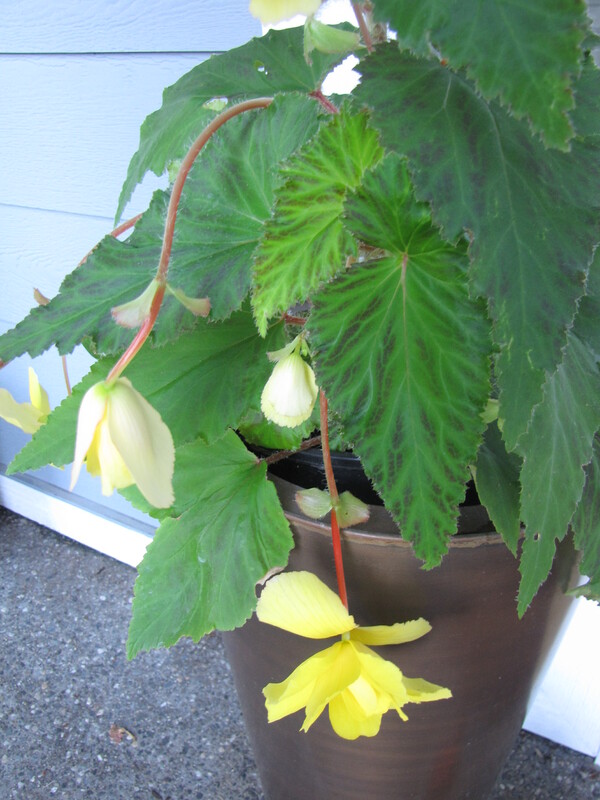 Recently, I have been doing research on buying some Begonia odorata for next year. 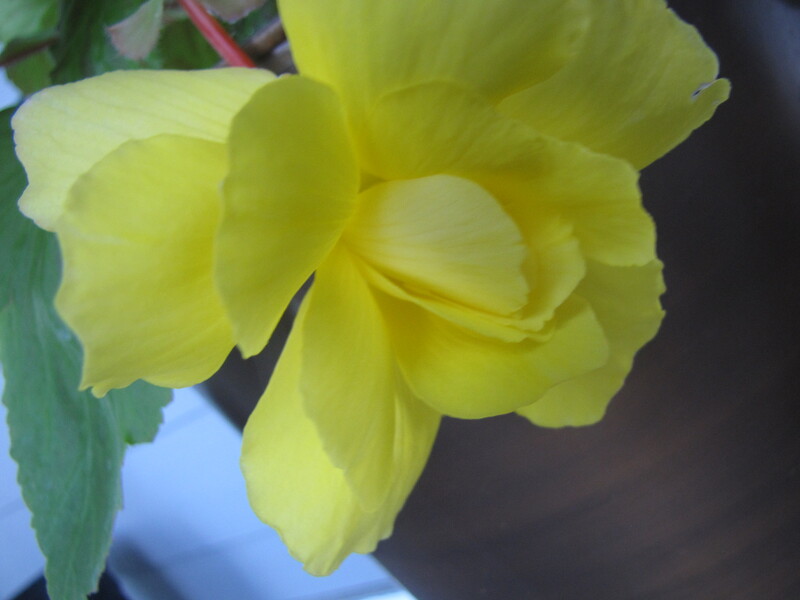 A fragrant Begonia – what more can this girl ask for! 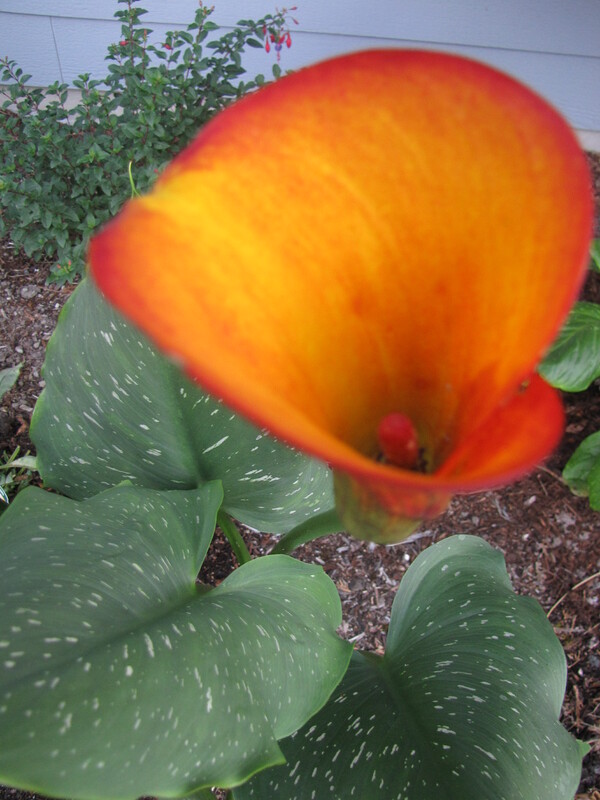 Yes, Calla Lillies (Zantedeschia) are hardy in my garden. I have a small area that is sheltered by two sides of my house and I believe it is a microclimate for plants that would prefer to be grown in Zone 8. Typically, these beauties are sold at garden centers in our area to be used as annuals in container designs. When I moved from my Zone 5 garden in Michigan, I was absolutely floored seeing Hardy Fuchsias in bloom while visiting the Bellevue Botanical Garden. 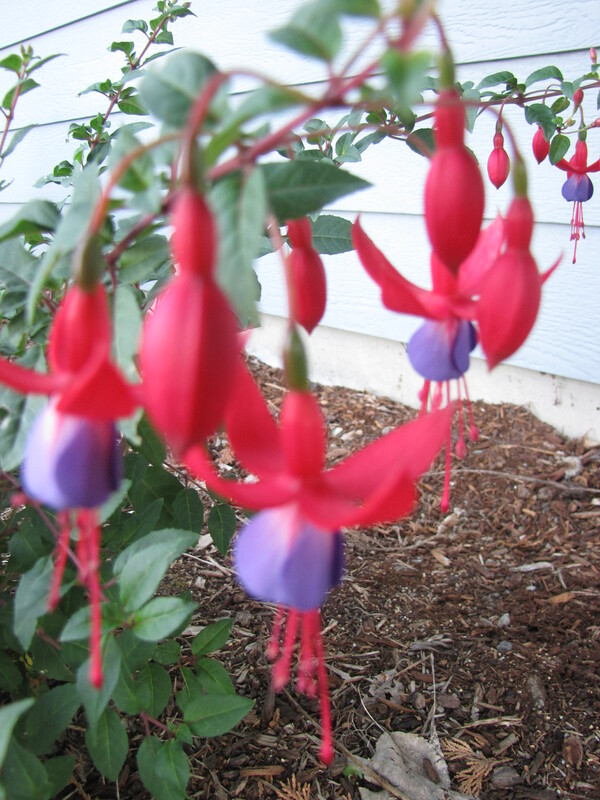 I couldn’t wait to have my own home again to be able to grow several Hardy Fuchsias. This variety is Fuchsia megallanica ‘Pat’s Dream’. I have several Coneflower (Echinacea) in my garden, but I was on a wild goose chase last year looking for this doll. It is the first double, orange Echinacea from Plants Nouveau with a fabulous name to match – ‘Hot Papaya’. It has been blooming its head of for several weeks. In my opinion when it comes to annuals, Non-Stop Begonias are the best bang for your buck for the shade. Their blooms brighten up the darkest corners and they come in a fabulous range of colors to choice from. And you know me, I haven’t found a Begonia that I don’t love. 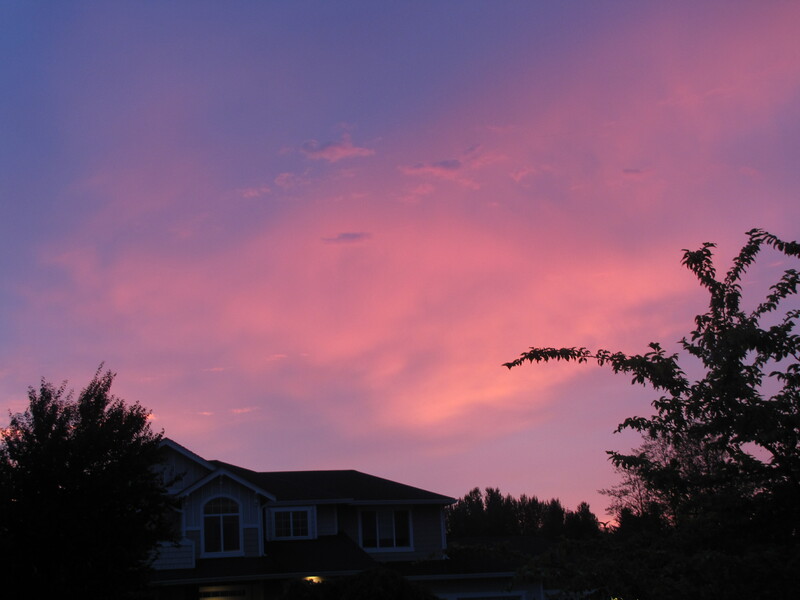 We’ll end with a gorgeous picture of the sunset on a beautiful summer day! I hope your garden is full of blooms and beauty. 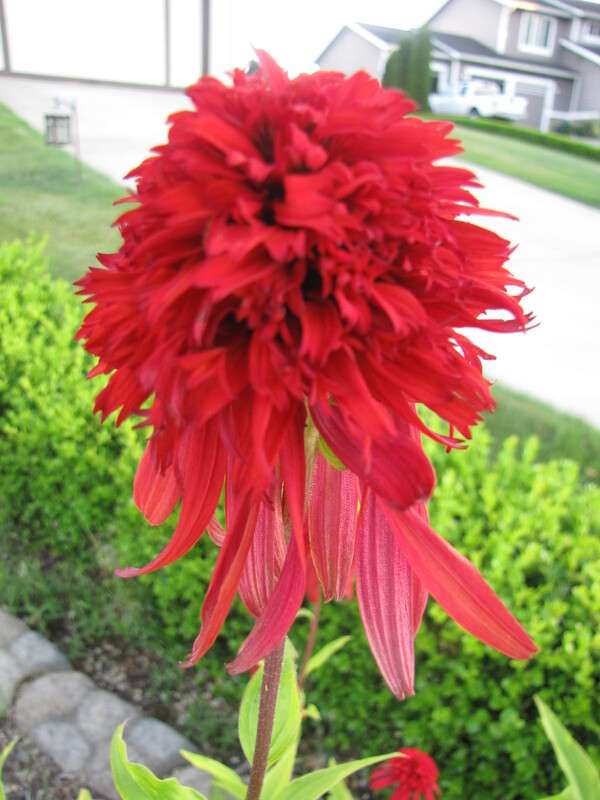 This entry was posted in Uncategorized and tagged August 15, Color, Garden Bloggers' Bloom Day, gardening, Landscaping, Linkage Love, summer. Bookmark the permalink. I never tire of looking at beautiful flowers. Nor do I! Or photographing them for that matter. Have a lovely weekend! Love your sunset picture. You must love the garden…lots of lovely blooms. Thank you! I love all things associated with nature – gardening, sunsets, birds, etc. Happy GBBD! I’m also growing ‘Hot Papaya’ for the first time this year and I love it! It’s so fabulous. I’m just starting to get into Begonias too. Yours are very pretty. I actually like the leaves better than the flowers. Happy GBBD to you!! Yes, the leaves on Rex Begonias are amazing. One of my favorites is Escargot. These tuberous Begonia leaves are beautiful, but don’t have the same textures and patterns as Rex do. ‘Hot Papaya’ is a fabulous plant. Plants Nouveau really know how to pick them. I’m a newish garden blogger as well. Your blooms are lovely. You have a lovely garden… Best of luck with getting to be outside on a daily basis! You mentioned in your about section that you are a wannabe hippie, do you have an organic garden?